This time of year, I always start craving some of the warm drinks I’ve had in France. One of my favorites was made for me by a barman named Jacques at the Café de Cluny, in the Latin Quarter of Paris—a man who lifted my spirits on more than one trip. A basic grog. So simple yet so perfect when you need one. Photo of my recipe by my good buddy Richard Swearinger. It was December, 1984; I was traveling around France with my former French instructor, Richard, whom I’d met and befriended three years before when I studied in Québec. Sadly, a day after I arrived in Paris, I came down with laryngitis. I wasn’t running a fever, but my throat was sore and my voice was shot. Still. I was in Paris. The last thing I was going to do was to convalesce in my hotel, alone. So there we were, drifting from café to café, as one does when young, flush, and in France (the exchange rate was an unheard-of 10 francs to the dollar). While we were standing at the bar at the Café de Cluny, the barman heard my raspy attempts at speaking. “Ah! Mademoiselle! Je vous ferai un grog!” (I’ll make you a grog!) he said. 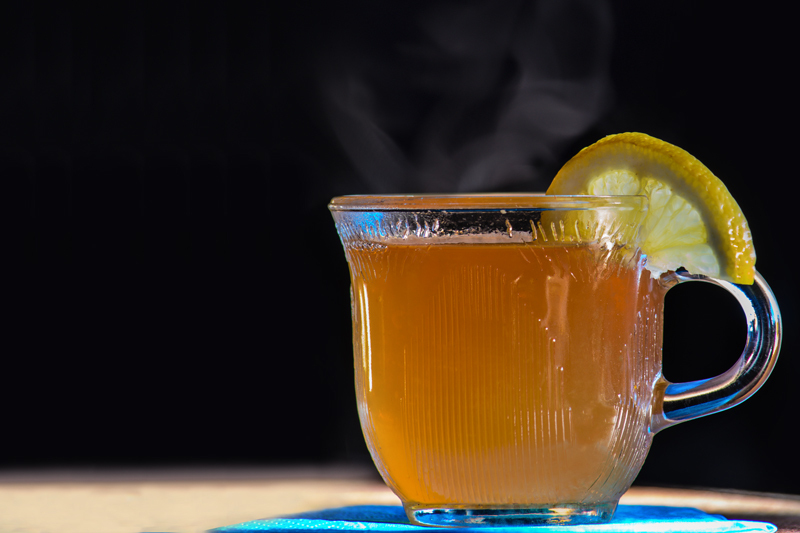 He stirred together a lemony-rum concoction and lovingly placed it in front of me. It was just what I needed. Although I still couldn’t talk, I felt infinitely better. After a few nights, we got to be chummy with this barman, a chatty and rotund middle-aged bonhomme named (of course) Jacques. The Café de Cluny was near our hotel on the Rue des Ecoles, so it became our last stop for a nightcap before turning in. Jacques seemed to enjoy talking to us late into the evening; we’d keep him company as he wiped clean the glasses for the night. And then, our trip came to an end, as all trips do. Fast forward to the 90s: On a trip to Paris with my husband and brother- and sister-in-law, I remember remarking to myself that this was the first year that I had been called “madame” in France. In previous years, I was always called mademoiselle, whether I was traveling with a monsieur or not. Wandering around Paris those few days, I kept catching glimpses of the landmarks of earlier trips and experiencing that sense of time passing, of growing old—a feeling that comes into sharpest focus when you come upon places you had visited in your youth. 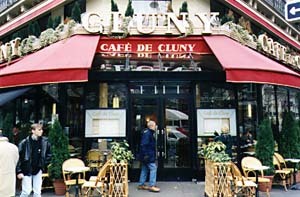 While strolling through the Latin Quarter, we stumbled upon the Café de Cluny. Curious, I steered everyone inside for a drink at the bar. Jacques did an ever-so-slight doubletake, but immediately composed himself. He came out from behind the bar, embraced me, kissed me on both cheeks and asked how I had been. Of course, I don’t think for one moment that he recognized me after ten-odd years; he was just being gracious, that’s all. I told him that I didn’t expect him to remember me, but I had been here with my Québecois friend many years ago, and he had made me a grog one night when I was suffering. “But of course I remember you,” he kept saying. Finally, he conceded that, yes, it might have taken him a moment to recognize me after all these years. But if so, it was “parce que autrefois, vous étiez une fille, et maintenant, vous êtes une femme.” (Back then, you were a girl. Now, you are a woman). Best of all, he said this as if I had somehow, over the years, transformed from something elementary and unformed….and into a marvel. Yes. The French have a way of doing this, when they want to. And when they do, it’s one of those moments that makes you glad to be alive…and in France. So, in that spirit, give my grog recipe a try this season. May it lift your spirits—as Jacques the barman lifted mine, first as a fille, then as a femme. In honor of Jacques the Barman. Stud the peel of the lemon wedge with the cloves and drop it into a heatproof mug. Add the rum, lemon juice, and sugar. Fill the mug with boiling water, stir, and serve. Thank you for sharing this lovely memory. I am sad to say that while I am certainly a femme today, on my last trip to Paris I was somewhere between a mademoiselle and a madame. Too long between trips! This took me on my own stroll down memory lane. I love the thought and the grog! What a “marvel” of a story. Makes me want to go to the Café de Cluny and order a “grog,” and hope that Jacques the Barman is there!